French, Tree of Jesse. 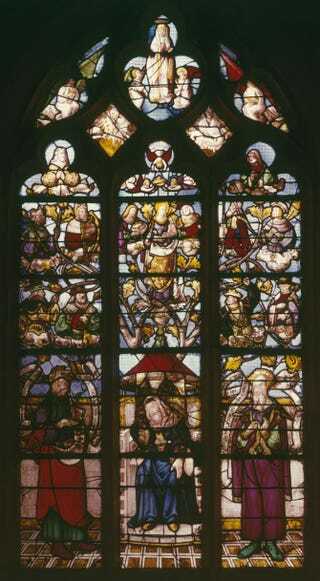 Stained glass window, circa 1522-25. Within the flowering branches of a divine version of the genealogical tree, eight biblical kings flank a majestic vision of the Virgin Mary. The stunningly vibrant, winding scheme is known as the Tree of Jesse, after the progenitor of the line that ultimately ended with the Virgin Mary, the mother of Jesus. Medieval theologians, seeking justification for her son’s role as the long-promised Christ, or savior, found their proof in the words of the biblical prophet Isaiah: “And there shall come forth a shoot out of the stock of Jesse, and a branch out of his roots shall bear fruit” (Isaiah 11:1). In this spectacular but anonymous example of the art of stained glass, one of the ancestors of Christ has been rendered as a youthful black king. As will be seen, the choice of a black man for this exalted position seems related to another, broader scheme of the earth’s population, which has been conflated with the Tree of Jesse to create a universal state of divine redemption within Europe’s ever-expanding knowledge of the world. The visual metaphor of the tree of descent first appeared around 1100 and underwent several changes in format before arriving at the arrangement pictured here. Surviving windows of this type provide a stunning visual assertion of the descent of Christ on an architectural scale. These multicolored interpretations of divine genealogy occupied key axial positions within the church interior. In the case of the Tree of Jesse at Ancourt, France, the window was placed high in the apse, a circular area framing the high altar of the church of St. Saturnin. From this exalted position the divine right of kingship shone down on the liturgy of the Mass performed on the high altar. The magnificent stained glass ensemble graced not a major cathedral but a relatively small parish church in a northern-French village of well under 1,000 people. In accordance with Scripture, the central motive of the window shows Mary rising to be crowned queen of heaven, so inaugurating a new celestial order of maternal grace. The monarchs of ancient Israel gather at the divine mother’s side, all of them descended from the patriarch Jesse, seen sleeping on a canopied, thronelike seat. His son, the renowned King David, appears far above to the left. In the order of heaven, however, David rises from his petaled cup to a place of honor directly to the right of Mary, singing her praises on his many-stringed harp. One of the most notable and unexpected innovations of the traditional branching scheme is the inclusion of a black king, appearing in his own exalted position beside King David. His eyes gaze devotedly up at the miraculous glorification of Mary. Clearly of dark complexion, his face is rendered in stained glass colored with brownish-purple oxides, which have now partially faded. His broad nose recalls the generic form commonly used in early-modern representations of black people. Another unique feature is his mouth, slightly open to reveal two rows of white teeth. The primary role of the black king in the lineage of Christ brings up a host of issues. Both his race and exotic origin, denoted by the turbanlike crown, set him apart from the usual representation of Christ’s descent from biblical kings. The intriguing presence of the black king is only enhanced by his appearance in another stained glass window of the same period, this time in the nearby cathedral at Evreux. As far as is known, the consideration of a member of the holy kinship as black is restricted to a brief period in the early Renaissance, when this window was made, and seems never to have been diffused beyond the region of Normandy. Although the existence of only two examples of a black king in this context does not constitute truly convincing evidence of a real trend in the representation of the Tree of Jesse, his inclusion clearly has something to do with broader changes in attitudes toward blacks in the Christian concept of the world order. The most reasonable explanation for the black king’s presence among the forebears of Christ can be found within the similar context of medieval-world chronicles. The direct line of descent of Mary and her son from Jesse, and through him David, was based on a universal history likewise derived from biblical accounts. These began with the origin of mankind in the Garden of Eden and continued with the resumption of the earth’s population after the Great Flood. The same branching structure that formed the Tree of Jesse admirably served the purposes of the medieval historian. Illustrated examples of the great ages of world history were explicated by the scroll format in order to present the progenitors of the world in an elegant, intelligible fashion. The person of interest here is Ham, son of Noah, whose progeny was cursed after an act of filial impiety. Ham, like his brothers, was understood by medieval theologians to be one of the progenitors of the world’s peoples following the flood. Ham’s subsequent association with Africa brought with it the historic curse upon his descendants, a negative judgment that was later used to justify the exploitation of the continent for slaves and other resources. In Hartmann Schedel’s well-illustrated Liber Chronicarum, published only a generation before the Ancourt window was set in place, this view is not explicitly stated. Instead we see Dathan, the last descendant of Ham, rendered as a black man emerging on equal terms with his light-skinned kinsmen from his own floral cup among the scrolling branches. The same is true of the black king in the Ancourt Tree of Jesse, and so the transposition of a black African descendant of Ham into the mainstream of humanity seems to have been taken at face value. Although the precise reason for including the black king at Ancourt may never be known, iconographers—that is, those who give visual form to the guiding principles of their day—may have been attempting to universalize the Christian message of salvation through the inclusion of non-Europeans. A similar phenomenon was occurring at this very time to the east in Germany, where Cardinal Albrecht of Brandenburg zealously sought to procure relics of the black warrior St. Maurice. This renowned exemplar of faith and steadfastness had long since become the spiritual aegis under which the expansive agenda of the Holy Roman Empire was pursued. A further sign of an increasingly broad outlook on the world occurs in another stained glass window at Ancourt. In it, the youngest king to adore the Christ child in the manger is black, an occurrence not uncommon in the rest of Europe but still relatively rare in France. The actual king of France, Francis I, was known for his energetic statecraft and political ambition for his realm. Though the presence of a black king in the Tree of Jesse window at Ancourt bears no direct sign of royal influence, his remarkable inclusion among the storied kings of Israel reflects the dawn of a new age fraught with its own double-edged consequences for the world beyond its own borders.